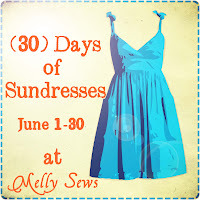 Today's a fun day for me in the world of my blog...my first guest post EVER is over at Melly Sews, as part of the Sundress Series! The mini-tutorials will be up later today so come back soon!! If you haven't already, check out the current giveaway...today's the last day to enter! 2 comments on "Coming Soon: Bayern Sundress Tutorial - Guest Post & Mini-tutorials"
I am so glad that you are participating in the 30 days of sun dresses because that led me to find your blog. Such cute stuff! I love the little boys blazer. Boys clothes really intimidate me. You have a couple of skirts posted that I can't wait to sew for my little girl. How wonderful, Jessica! Thank you for visiting...I'm on my way to check out your blog!